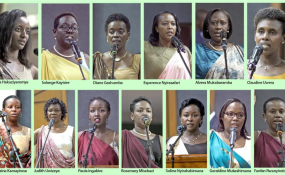 The women in Paul Kagame's new Cabinet. When President Kagame announced his new Cabinet last week, among the things that stood out was the number of women appointed and the entry of youthful first-timers. For people not familiar with Rwandan politics, this is without a doubt exciting - rightly so. There is a lot of talk about the low number of young leaders in Africa and yet the average age of youth on the continent is less than 20, creating a disconnect with the leadership in many places. In addition, there are too few women in leadership positions yet their roles in the socio-economic growth of any country is critical. This probably explains why transformational leaders are increasingly building teams with more women and younger members. For Rwanda, this journey did not start last week with the appointment of the new cabinet. It has been on for more than a decade. About 15 years ago, Rwanda was ranked 37 globally for the number of seats held by women in Parliament. Today, at over 60 percent, Rwanda has the highest percentage of women in parliament in the world. The previous cabinet had more than 40 percent women, a high proportion by any standards. With the latest reshuffle, women hold more than half the full ministerial positions. To understand the age demographic of the new cabinet, one has to appreciate the country's journey. The liberation struggle was organised, commanded and won by men and women largely under 35. The youngest minister is currently 31 and was a member of the previous cabinet. With the entry and re-appointment of other youthful men and women, the average age of the new cabinet has fallen to 47.5 years. Of course, it is not only youthfulness or being a woman that qualifies one to be a leader, but a combination of other factors including skill, experience and the ability to deliver results. However, if the Rwanda's transformation over the last two decades is anything to go by, the performance of women and young Rwandans in various leadership positions across sectors serves as motivation to include them more.